Cyrus wishes you a very fiery Christmas! I'm thinking of changing Guile's eyes to brown. 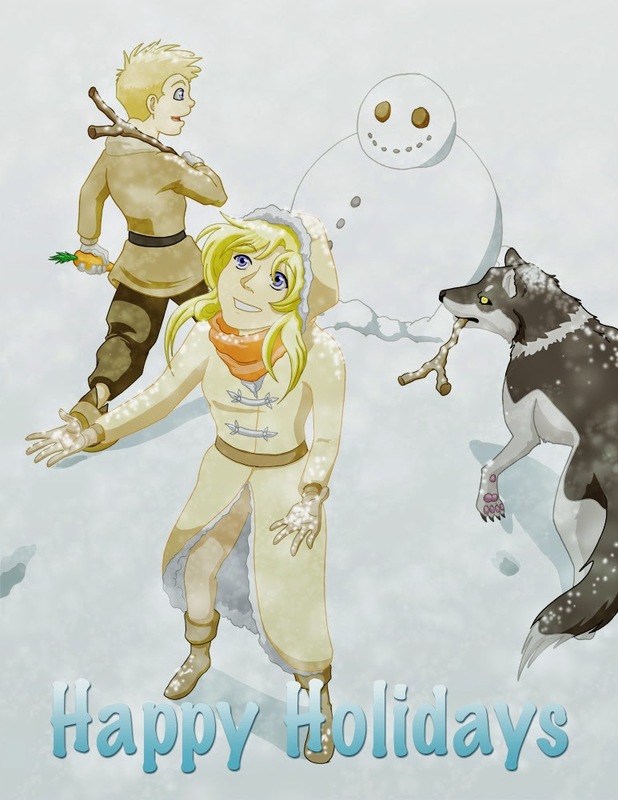 It's a minor adjustment, but having two blonde, blue eyed characters might mistakenly make them appear related. I'm sure you can tell who the two Extroverts are. I will also be going to DragonCon 2014, but I won't have a table there. This will be my first time attending such a huge convention - my understanding is that it spans over 4 hotels! - and it's during the school year. In order to have an art table at a large convention like that, you have to be able to be there from the morning of its first day, and break down at the end of the last day. DragonCon is too far away and during school, but nonetheless I look forward to checking it out! 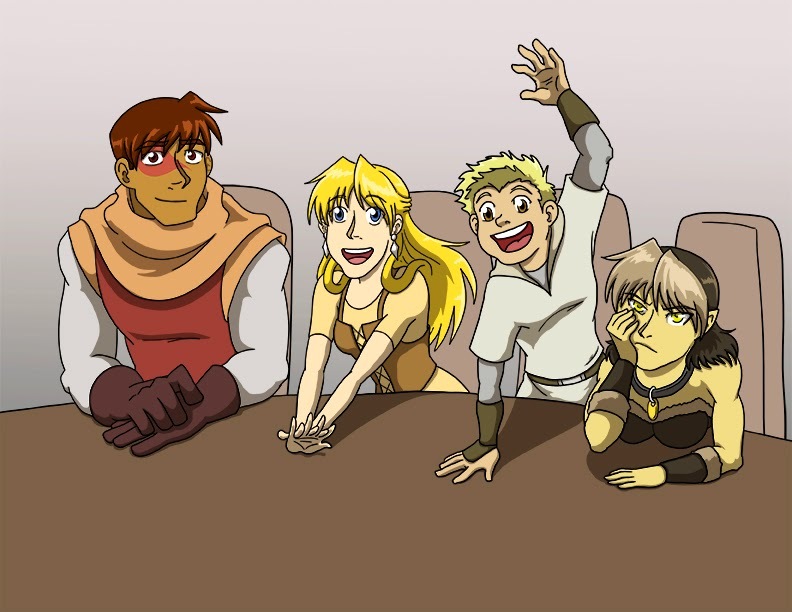 Fate Saga will also attending MegaCon 2015! That's a convention whose art tables get filled up quickly, so I reserved one as soon as they were open. When the event comes closer, I'll put up a seating chart to point out where I'll be. Other than the conventions, updates for Fate Saga have been slow. 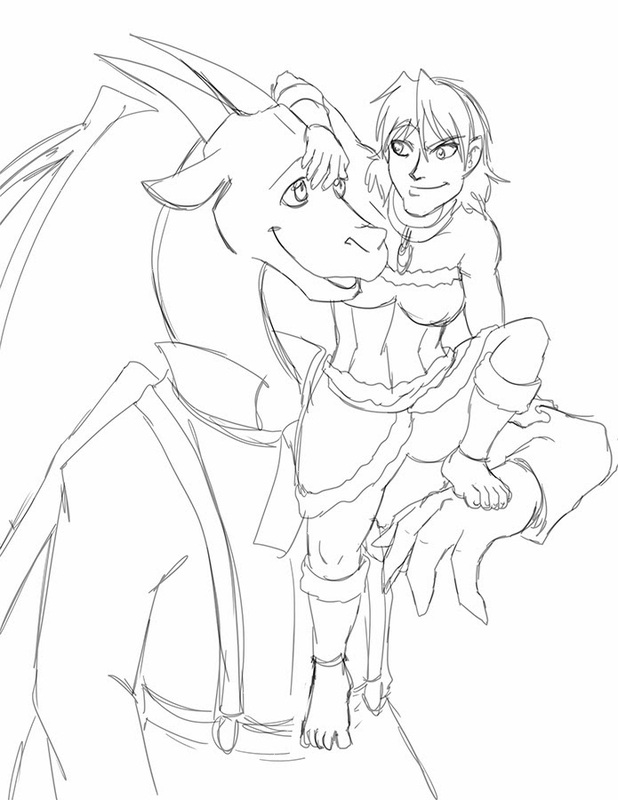 Work has to be my main priority, while Fate Saga is my prized pet project that I work on whenever I have free time. I've been mostly working on tightening the plot for future seasons and, consequently, coming back to the first season to update the episodes. There's not much updates that I can post here on the blog for the sake of spoilers, but rest assured that the story is still alive and continuing to develop. Fate Saga will be at Omni Expo 2014 This Weekend! Hello everyone! I hope any students and teachers are starting (or getting ready to start) a productive and relaxing summer. I've taken this short time to preparing for this summer's conventions, and now my first con of the summer is approaching - Omni Expo at Orlando, FL. I will have an art table there located at table 17. And amongst my usual wares I will be selling Fate Saga merchandise and commissions. I hope to see you there! 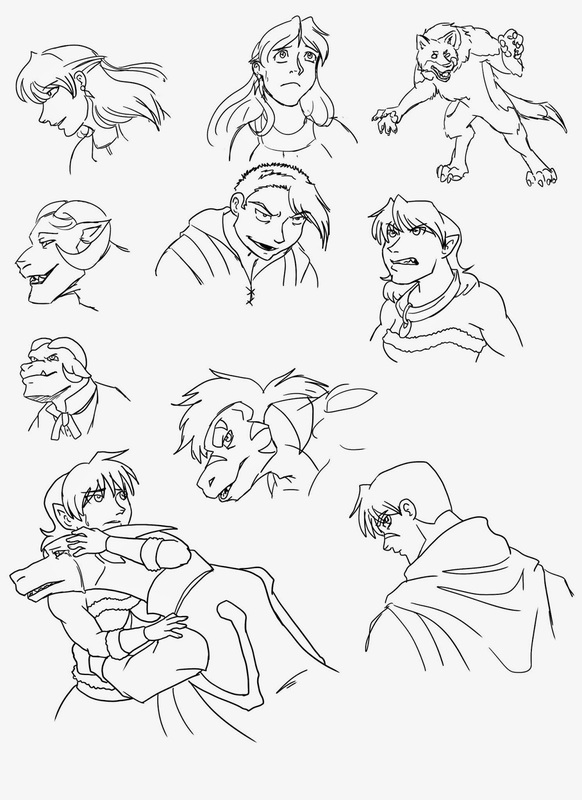 Above are some Fate Saga warm up sketches. Happy (belated) Mother's Day! I know I'm a day late but late is better than never, right? 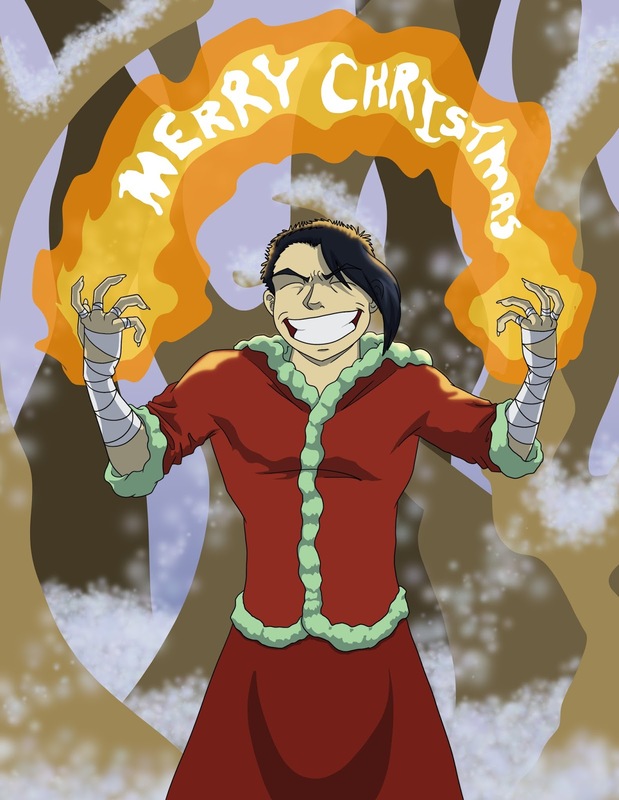 I like to try and get in a holiday Fate Saga drawing when I can, and who else would be a better candidate for a Mother's Day image than the only major character who is a mother? Rori may not be Guile's mum by blood, but she's the closest to one that he's got. It was an interesting challenge to draw Rori looking genuinely happy/laughing while still keeping her on model/in character. The woman hardly ever smiles, and when she does it's usually cynical. Guile's supposed to be about 3 or so in this picture. I'm not sure if he's too small since Rori's a small lady (about 5'1-ish) to begin with. Hello everyone! As readers of this blog may know this past year has been pretty heavy work-wise. On a good note, I've had several major animated freelance projects, and I'm finishing up my first year at the University of South Florida and third year at the University of Tampa. While it hasn't given me much time to work on my own projects, it has really helped give me more experience and networking contacts both of which will only be a help to Fate Saga in the future. 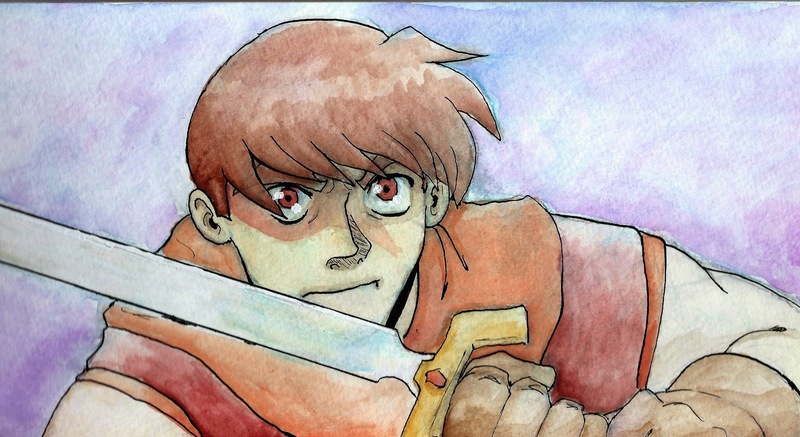 As my pet project, Fate Saga is always on my mind, and with the summer should open up time for more frequent updates. I will add any additional conventions to the list as I sign up for them. Unfortunately, I will not be able to attend Florida Supercon this year, but I am excited to see what these new conventions will be like. I hope to see you there! Finally, I wanted to take the opportunity to promote a fun and sassy short film, Tofugu, created by a brilliant young lady, Rina Walker, for my Beginning Animation class. She made every part of this project, from concepts to voice overs and animation, in the span of about 6 weeks (which, for those who may be familiar with the animation production process, is an insane amount of work in such a short amount of time). As a teacher, it's a joy to see the creativity and work that comes from my students. Please feel free to check it out! 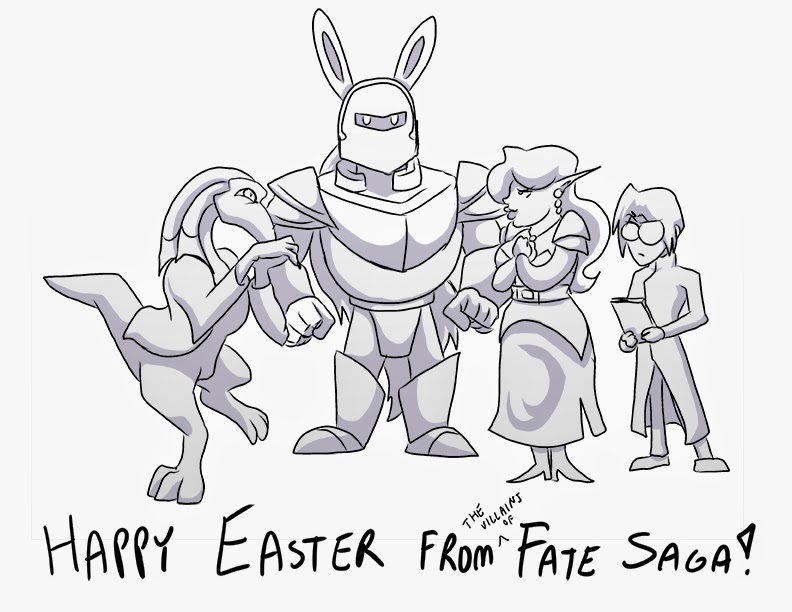 Happy Easter from the Villains of Fate Saga! With finals coming up (and just this whole semester in general) I haven't had much time but I wanted to do something cute, simple, cartoony and fun for Easter! Credit to my pal Tara Olding for the bunny ears idea, and credit to the amazing Jess and Tracy (co-creators of Taffetas) because it was their adorably awesome Laryngitis comic that inspired me to try simplifying the cast into basic shapes and see how much fun they can be to work with. I'm nowhere as good at it as they are, but on occasions like this it's fun to give it a try! Vektor can bring feng shui to any room. 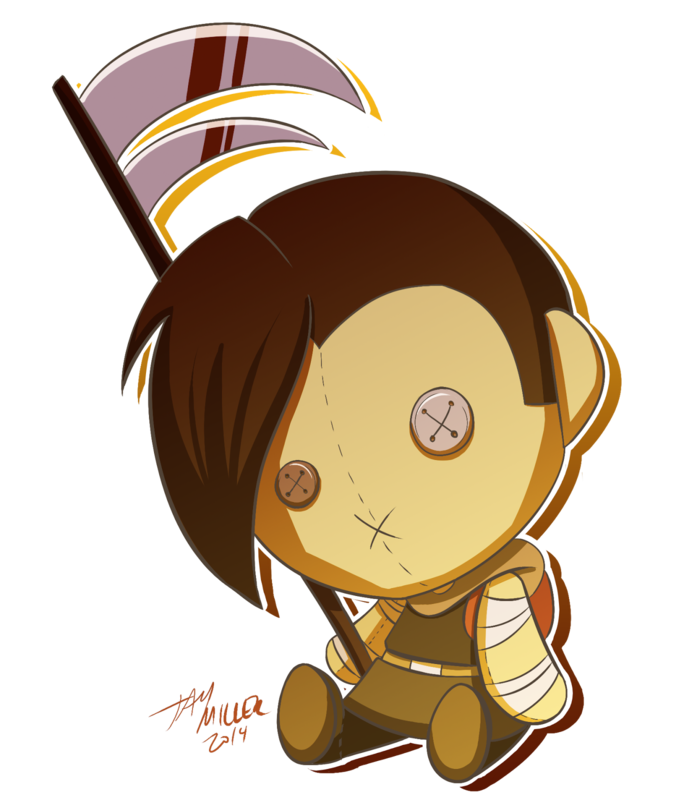 Cyrus Plushie Illustration Birthday Gift by Jay Miller! March 6th was my 30th birthday, and this adorable little Cyrus plushie drawing was an unexpected and wonderful gift from the awesomely talented Jay Miller! 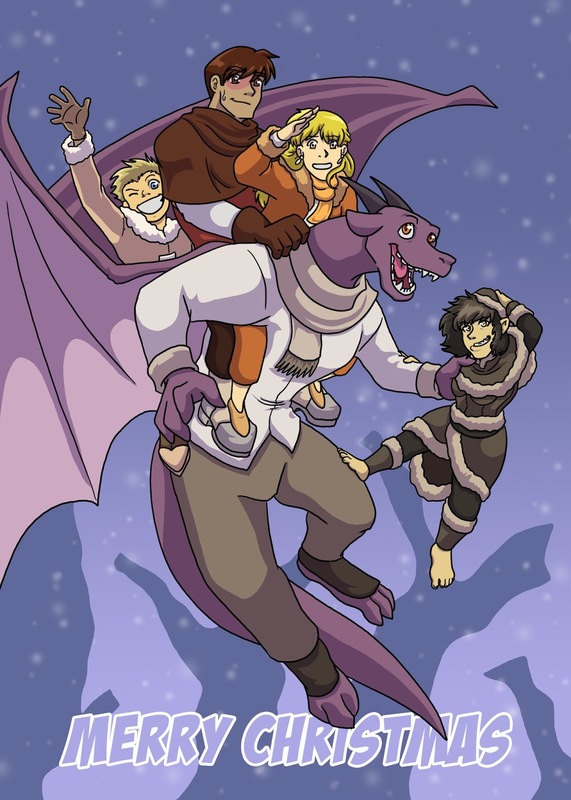 Check out this image and his other fantastic words on his DeviantART account! 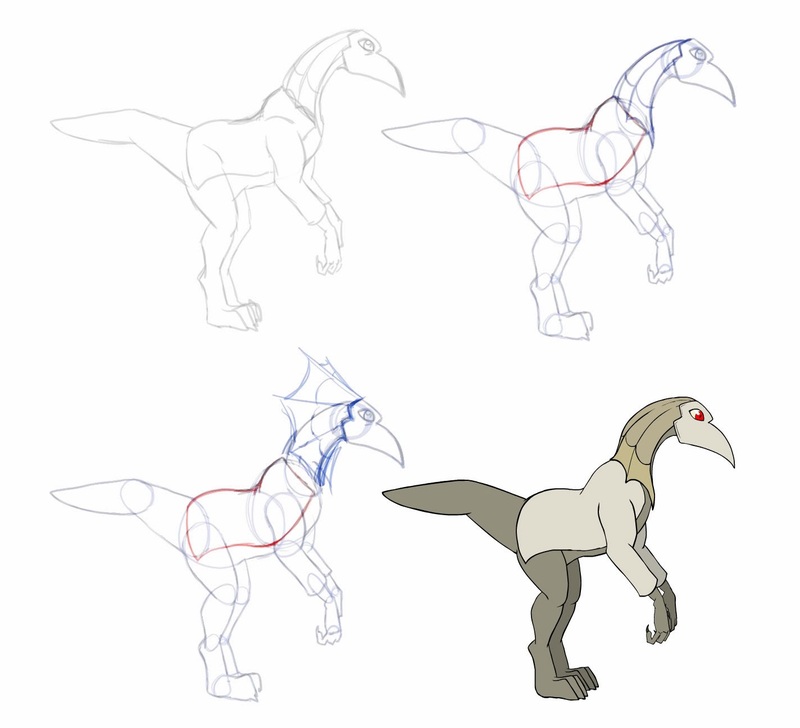 Last semester, for my Animation class I had put together a Lukas puppet as a demonstration on how a 2D puppet is constructed, and how to draw one out from a base sketch. This semester, I'm going to provide the Lukas puppet along with other puppets I've made for the students to experiment with. However, before I handed it over, I wanted to do a short test on my own to ensure the puppet's functionality. Especially since Lukas is one of the more complicated characters (having a flexible neck, tail, lab coat, frills, etc. It's more complex than some of the more base rigs they'll have a chance to experiment with). His neck is done with frame-by-frame animation, but everything else is puppeted. He has an alternate frill (where it's spread out in his 'fear' or 'aggressive' state) and alternate eyes (wide eyes, shut, narrow). Coming up, I may do a dialogue test which will stretch the bounds of the puppet and use alternate parts, but for now I wanted to test its base functionality. And, of course, since there was a need to create and animate a puppet, I just had to do one for Fate Saga. It's great to see Lukas move for the first time!